High beams are special headlights that project light much further than your regular lights. They are designed to be used on dark country roads and other low-visibility situations. When used properly, they can help you remain safe. However, there are other times when driving with your high beams on could be dangerous or even illegal. The first step toward knowing how to properly use your high beams is to be aware when they are on and off. When you get used to the way the road looks when lit by high beams, you can sometimes forget that you have them on. This is a recipe for disaster if your beams were to blind an oncoming driver. Most cars have an indicator light that shows if the beams are on or not. Pay attention and be ready to shut them off when needed. The laws vary by state, but most states require that you shut off your high beams when approaching other vehicles. Some laws require they be off when you are within 500 feet of another car, and others give you a little more allowance. No matter what the law says, it’s always a good idea to shut off your high beams regardless of whether you are approaching oncoming traffic or coming up behind a vehicle in your own lane. Just as you could potentially blind another driver, you could also be blinded by unexpected high beams. If you see another car coming toward you with the high beams on, do not flash your own. Many people will advise that you do this to alert the other driver, but you could just as easily blind him or her and cause an accident. Often times, the driver will remember the high beams and shut them off, but if this doesn’t happen, do your best to look to the right of the lights instead of staring directly at them. If a driver comes up behind you with the high beams on, switch your mirror to night mode to reduce glare. If you are driving through a hilly, curvy or forested area, you can sometimes see the light coming from the headlights before you can see the cars themselves. 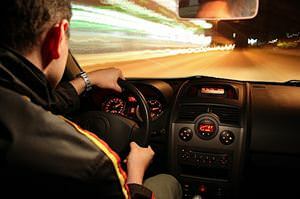 If you see light moving across the trees or hillsides, shut off your high beams and wait for the oncoming cars to pass. When headlights are aligned correctly, they shouldn’t cause glare on another driver’s windshield. However, regular use of your vehicle can cause your headlights to slightly change direction over time. Experts recommend that you have your headlight alignment checked by a professional at least once a season. If you now realize that you have been driving around other cars with your high beams on, don’t beat yourself up about it. This mistake is common amongst new drivers, especially those who are getting to know a new vehicle. The chances of your high beams causing an accident are relatively low, but you should still exercise caution when using them in the future.